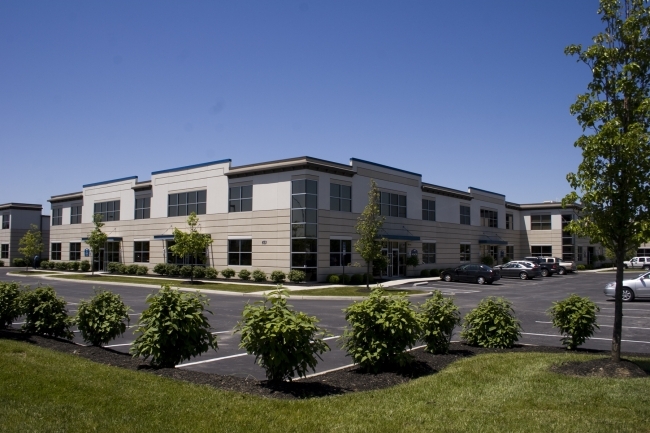 The Westerville Hoff Woods Business Center is a three (3) building multi-tenant flex office complex situated on a 9-acre corner site in a rapidly growing upscale community. The complex was designed to maximize the site with the buildings and the required parking while providing generous landscaping for aesthetics including an enhanced buffer along the west side adjacent to an existing bicycle path. Buildings 1 and 2 are 38,400 sq. ft. each with 16 individual suites while Building 3 is 35,308 sq. ft. with 14 individual suites. The exterior is a painted pre-cast concrete wall panel system with an EFIS (Exterior Insulation Finish System) cornice to give definition to the buildings. Over each entrance is a metal awning to define suites and provide protection from the elements. The windows are insulated bronze tinted glass with full height glass at the corners. The one-story suites have optional mezzanines capabilities and loading docks on the rear elevation.